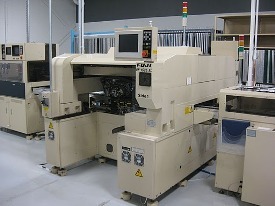 This machine includes (4) PFU-4Es....The machine uses two detachable power feeder units, one at the front of the machine and one at the rear. 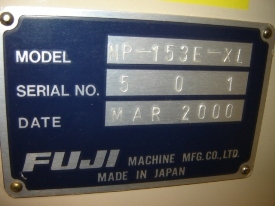 The PFU-4Es are incorporated into the machines design to increase production rates as well as to minimize changeover time. Each PFU features 40 slots that are capable of supplying up to 80 part types via 8mm double channel feeders. 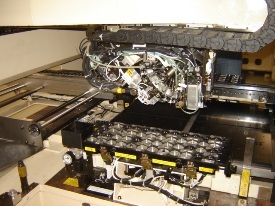 In addition, PFUs support batch changeover and splicing, Simultaneous replacement of feeders occurs by simply unlocking a PFU, rolling it away, and replacing it with another PFU. 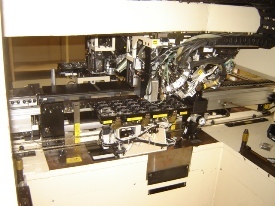 The machine has Twin-Carrousel Placing Heads which provide high efficiency. Each is fitted with 16 nozzles. 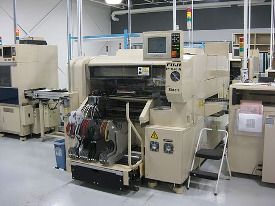 On the fly vision processing is performed as the placing head rotates. 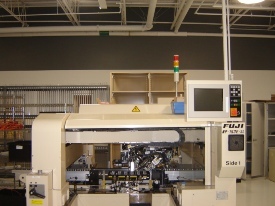 Machine idle time is minimized by integrating the operation of the twin table and twin placing heads.